In 1988 the Brotherhood of Madmen of Mont Ventoux was created to show that any normally trained cyclist could climb the ‘Giant of Provence’ by the three main roads to the summit in one day without excessive fatigue. The climb will be in the same day (but in the order and the date you prefer). Of course, simple doesn’t mean easy. To complete the Cinglés means more than 4,500m of climbing (and descending), up a mountain, in one day. A mountain where the wind reaches 320kph at the top – although they generally close the passes if that’s the case. The weather hadn’t been great the day we arrived and the summit was barely visible from our hotel location just outside of Bedoin. But fortunately for us the forecast for the day of our attempt was favourable. Temperatures in the high 20’s and low winds. 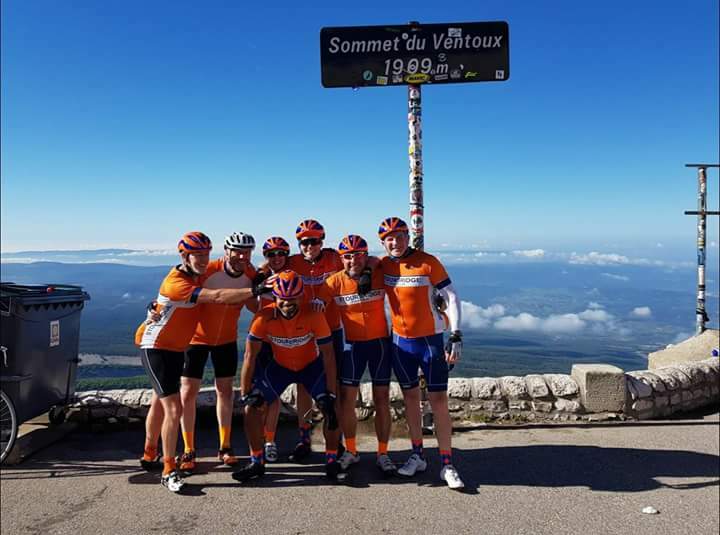 On Friday 1st June, seven club members, myself, Carl Rogers, Darren Holyhead, Steve Denison, Simon Mills, Neil Ruston and Kim Babb set out with varying ambitions to try and tame Ventoux. Leaving the hotel at 6am for an early start we had clear blue skies and cool temperatures. The summit today was clearly visible. The Bedoin ascent is 21km long, rising 1,617m. That’s an average of almost 8%. For 21km. It takes in the Chalet Reynard and the Simpson memorial. The road rises, gently at first, then about 6km in it ramps up. This is the infamous forest section. The road rises to average 9% for the next 10km, with entire kilometres averaging 11%. When you finally emerge from the forest, which at times seems never ending, Chalet Reynard appears in the distance. From the Chalet the summit is a further 6km away. The gradient does drop slightly for the final stretch and averages out at roughly 8%. We all made it to the top in varying times. But all not too far apart. Neil, who had suffered with a sickness bug through the night and barely had an hours sleep supported Kim the entire climb and helped spur her on to overcome her fears of the climb. By the time the famous lighthouse at the summit was in view they were both singing their way to the top! Don’t Stop Me Now – by Queen, was the song of choice. After descending to the village in Malaucene, serious self doubt had started to creep in. The first climb had been brutal at times and the temperature was rising fast. Neil very wisely took the decision to call it a day due to illness. So, himself and Kim headed back to Bedoin happy with their work for the day. It was at this point a few of the group were wavering on the second climb, let alone the third. Stevie D soon put any negativity to bed. Insisting we see through the task at hand, and the sole purpose for travelling to southern France in the first place. The ascent from this side of the mountain is easily as tough as from the Bedoin side, made harder by the fact you have already been cycling uphill for a good two hours or so. For 5kms in a row the average gradient doesn’t drop below double figures. 10%, followed by 2km at 11%, then another km at 10% and finally kicking up to 12% for the last section of this tricky middle bit. We were all suffering badly. Carl was cramping, we were all overheating and generally just taking it one pedal stroke at a time. By the time we all made it to the summit again a sense of achievement really started kicking in and it was at this point I knew we would all make the third climb, no matter what. A special mention must go to Simon at this point. His celebrations at the summit after the first climb were loud to say the least. But because it was so early not many were there to witness it. Not so on the second climb. The summit was buzzing with fellow cyclists and tourists. But Si’s celebrations were so loud and such a joy to see it left nobody at the top in any doubt as to how much it meant to him. Kim had cycled to meet us in Sault and it was great to see her greeting us with ecstatic waves as we made our way into the village. We spent a good hour or so refuelling at a local restaurant. All tired but happy at what we had already achieved. With spirits high we all set off for the third and final climb. The climb from Sault is very shallow compared to the first two. Only averaging 3.6% for the first 20km. It isn’t until you emerge at Chalet Reynard that the “fun” starts again. With the last 6km the same as the Bedoin route. Throughout the day Daz had been great at keeping morale high, and was his usual cheery self at all times. When we were struggling our way back up to the Chalet and conversation had somewhat diminished, Daz suggested we have an impromptu game of Eye Spy. We were all dying and he was still having the time of his life! Kim was going to cycle to Chalet Reynard and then drop back down to Bedoin and our hotel but by the time we reached the Chalet she decided a second ascent of the day was now achievable. Likewise , Carl was seriously considering calling it a day at the Chalet also, due to the serious cramps he had been suffering with since halfway up the second climb. But when push came to shove they both dug deep and battled on with the rest of the group. We all made it to the top again. Some easier than others. Unbeknown to the group, Stevie D had suffered a very unfortunate saddle malfunction with 5km to go. His saddle was now pointing upwards and seized in position. He basically had to cycle the last few miles, and hardest part of the day, out of the saddle. Extra kudos for that one mate. The group comradery throughout the day was outstanding. And I don’t think any of us would have been able to do it without each others support. In total we cycled 85 miles, with an elevation gain of 14,698 ft.
It’s also worth noting that even though Kim didn’t do all three climbs, she still managed to get in 12,277 ft of climbing for the day!